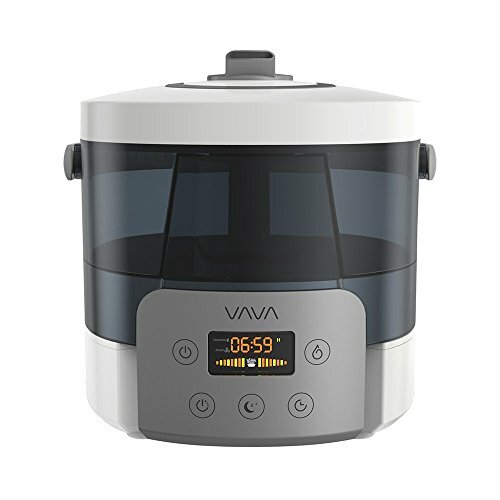 Take a deep breath as fresher, healthier air is here with the VAVA VA-AH010 Ultrasonic Humidifier. Featuring a convenient top loading water tank, simply lift the lid on the 2.5 L / 84.5 oz chamber and pour in water while avoiding spills and leaks. Whereas other humidifiers offer only a small hole making it harder to clean, the wide-opening on the spacious water tank allows you to easily get your hand inside for a quick rinse and wipe. With more space, you're able to clean the tank more thoroughly and reach corners you may have previously been unable to reach. The VAVA humidifier has safety in mind from the top to the bottom. When lifting the tank off for cleaning, the base will be exposed. Thankfully, it has a low voltage, meaning that it will not harm you if accidentally touch when the humidifier is on. In addition, the base remains dry as it is separate from the tank. This means it won't grow mold unlike other humidifiers who have bases that are typically filled with water. You won't need to settle for mist from only one direction ever again. Spin the rotational nozzle a full 360° to get mist wherever it suits you best. For personalized use, choose one of three timer modes to suit your needs. Auto-Start allows the humidifier to begin operation once a countdown reaches zero, while Auto-Off functions similarly with the humidifier switching off once the timer hits zero. On the other hand, Sleep Mode continues humidifier operation while switching off the LED light so you can sleep without disturbance.